Pendant made of 316L steel in silver colour - cross with black centre and decorative notches on shoulders. By buying this product you can collect up to 5 points as a voucher of $1.35. Your reward points. 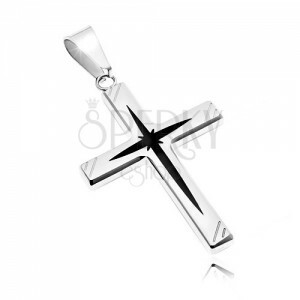 The steel pendant is represented by a shiny cross with black middle lines. Each shoulder is adorned with engraved diagonal notches. The pendant clasp is elongated.